If you're looking for wood flooring that you hope will last for decades, the obvious choice will be for a wood that is naturally hard. It is not enough to simply pick any so-called hardwood species, because hardwoods vary quite a lot in their hardness from species to species, and some are actually softer than some softwood species. To give some quantification to the issue of wood species hardness, the lumber industry created the Janka hardness scale—a standard now widely accepted as the best means of ranking a wood's hardness. The Janka test measures the amount of force needed to drive a 0.444-inch steel ball into wood to a depth equal to half its diameter. The higher the rating, the harder the wood. While there are other elements that go into how a wood species performs as a flooring material, the Janka scale will give you a good idea whether your wood floor will last for decades to come or will quickly surrender to the onslaught of dog claws and foot traffic. You might think that a wood species identified as a hardwood will always be harder than those identified as softwoods. But while it is true that most hardwoods occupy the top half of the Janka scale, the definitions of hardwoods and softwoods are actually biological distinctions. Hardwoods are from trees that are identified as dicot species. Dicots are plants in which the seed has two embryonic leaves (cotyledons). This is in contrast to softwood species, which are angiosperms—plants in which the seeds are unenclosed, as the pine cones of conifers. While it is generally true that dicot trees have harder wood than angiosperm species, there are numerous instances where softwood species are roughly equivalent on the Janka scale to some hardwood species. It is important to remember that the testing process used in the Janka scale is an impact test, not a test of scratching, scuffing, or any other wear and tear that flooring experiences. To learn the basic hardness of different common woods used in flooring, check the chart below. Higher numbers indicate harder wood. Solid hardwood, not engineered wood. Engineered wood has a thin veneer of real hardwood on top of a dimensionally stable plywood. Even if that veneer happens to be the hardest wood possible, such as Brazilian walnut or ebony, that veneer is still not thick enough to make the flooring truly durable. Solid hardwood flooring will always be stronger than hardwood-veneer engineered flooring. Hardwoods are better than softwoods. While the complete Janka hardness listings will reveal that there are some fairly hard softwoods and some relatively soft hardwoods, in the species most commonly used in flooring, the identifiers hold true: hardwoods are harder than softwoods. The most durable flooring woods will be hardwoods such as oak, walnut, ebony, maple, ash, and pecan. 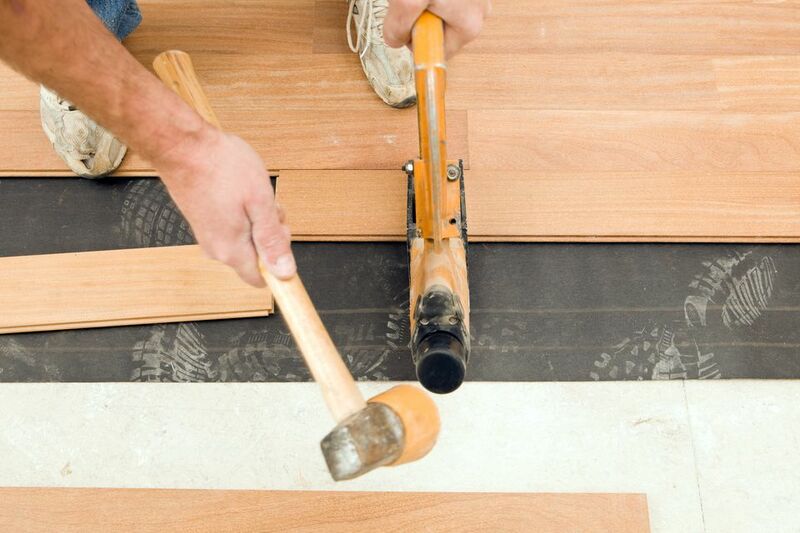 Softwoods such as fir, pine, and hemlock rarely work well as flooring materials, except in a shop or utility area. For the hardest woods, you need to look for exotics, not domestics. Exotics are sourced from areas like Indonesia and South America. Domestics come from Canada and the United States. Exotics are not always more expensive, especially when you shop at bargain wood flooring outlets such as BuildDirect or Lumber Liquidators. What About Bamboo and Eucalyptus? Some of the hardest floors available are strand-woven bamboo and eucalyptus, where you may see Janka ratings at levels from 3,800 to over 5,000, making them harder than all hardwoods. Yet these are not hardwoods. In fact, these plants are not wood at all but are instead grasses. The Janka hardness test is often applied to bamboo and eucalyptus flooring products after manufacturing—a process that artificially hardens the material by the addition of resins. Still, the very impressive Janka ratings accurately depict the excellent durability of these non-wood flooring products. No matter how high a wood species rates on the Janka scale, all wood floors do get scratched and dented through normal use. If you have kids or pets in your home, you will have increased concerns about dents and scratches. Softwood can be hardened to some degree by the application of polyurethane finishes. Hardwood is always much more expensive than the softer woods. Hardwood is more difficult to saw, drill, and nail than other woods, requiring more time and labor—which translates into greater expense. Softwood can work well in some applications—decks, shops, and outbuildings, for example. Looking For Cheap Brazilian Cherry Flooring? Try Malaccan Cherry.